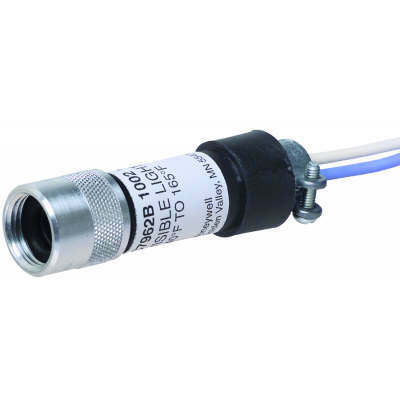 The C7962B Visible Light Flame Detector detects the visible light emitted by fuel oil combustion flames. The C7962B Detector is used with Honeywell Flame Safeguard controls to provide fuel oil flame supervision in commercial and industrial burners. Used with 7800 SERIES Flame Safeguard controls. Used with R7851B Flame Amplifier. Has an integral collar threaded (internal 1/2-14 NPSM) for mounting on 1/2 inch sight pipe.